Rise of the Treehouse Haters - Treehouse by DesignTreehouse by Design - So, you thinking about building a tree house? What could be more innocent that children playing in a treehouse in their own backyard? This dreamy scene reminds us of simpler times when the human world didn’t seem to weigh so heavily on our shoulders. When a day felt like a giddy carnival ride into eternity and the worst atrocity imaginable was being called away for dinner. These experiences, for those of us lucky enough to have access to a treehouse growing up, promised a lifetime of tender, cherished memories. Who on earth would burst such a precious bubble? Enter the treehouse haters. Treehouse haters, as the term implies, are people who dislike treehouses enough to drop a dime on children and turn them into the authorities. Authorities who, far more often than not, order these childhood treasures to be torn down before their teary little eyes. Cruel, isn’t it? But it happens all the time. 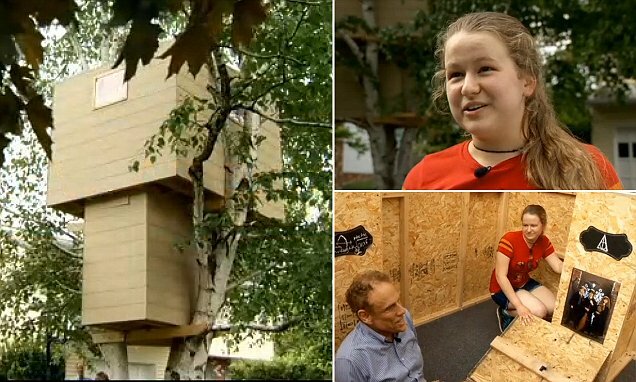 Here’s a story about a 14-year-old girl who fell victim to the treehouse haters next door. Pennsylvanian Elise Truchan’s labour of love (pictured above), which took her and her family and friends months, and no doubt hundreds – if not thousands – of dollars to build. She got wall-to-wall carpeting on the second floor for her birthday, personalized it with Harry Potter posters, decked it out with a fan and lights…all to be turned in by an annoyed neighbour. Now the structure, which looks to be extremely well built, has been ordered destroyed by the municipality. Here’s another ongoing and eerily similar story published the very next day. Is this what we’ve come to as adults? Telling on children and literally destroying their dreams? What kind of a heartless person would do something like this? That’s right, treehouse haters! Taking away children’s hard work and dreams is one of the lowest things a person could do. I also believe that it can have undesired consequences for treehouse haters. Children are going to spend their endless energy one way or another. If they’re not in the backyard where we can see them, what else are they going to be doing? As one such former child, let me tell you that a universe of mischief awaits children who aren’t occupied by the innocent marvels of treehousedom. So,treehouse haters, if you want to crush children’s dreams and evict them from their dreamy lofts in the trees, unfortunately I can’t stop you. But please don’t complain when those once very visible children suddenly vanish and you start finding bags of pooh in your mailbox or things broken or missing from your property. You’ll only have yourselves to blame. And I don’t think you’ll find too many sympathetic shoulders to cry on. When you dare to raid heaven, hell sometimes ensues.